The Florida State Fair will have also feature all day entertainment including Lady Houdini, All-Star Stunt Dogs Splash, Bello Nock Super Stunt Show, the Budweiser Clydesdales, Circus Hollywood, Demolition Derby, Extreme Illusions & Escapes, Kachunga Alligator Show, Hollywood Racing Pigs, Moto Maniacs Xtreme, Tyzen the Comedy Hypnotist, Zaji Amazing Acrobats of China and so much more. Military and Emergency Responders (police, fire and first responders) receive free admission for themselves and up to three guests with their official ID. Advance tickets and ride armbands are on sale at participating Publix locations through February 6, 2019 and online. Advance ticket prices are $9 for adult admission, $5 for a child and $7 for seniors. Weekday Ride Armbands are $20 and Any Day Ride Armbands are $30. 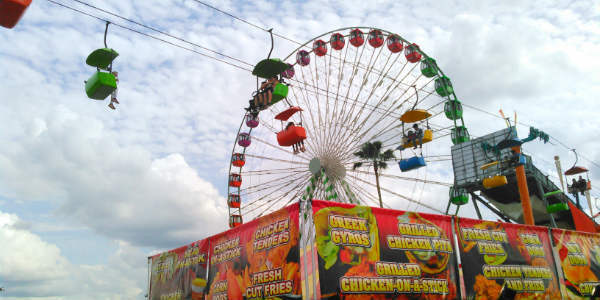 Advance ticket sales for the $79 Mega Pass which provides unlimited admission and rides throughout the entirety of the Fair, and the Senior Five Day Pass, will only be available through FloridaStateFair.com or at the Box Office.